The tablet comes with a 1.5 GHz dual-core CPU and 5 mp rear camera; will launch in Canada on 9th August, but price not revealed as yet. 7" multi-touch capacitive screen with pixel dimensions of 1024x600. 5 mp rear camera with 1080p video recording, 3 mp front camera. 1.5 GHz dual-core processor, 1 GB RAM. LTE (700, 1700 MHz), HSPA+ (2100, 1900, 1700, 800, 900 MHz). Wi-Fi: 802.11 a/b/g/n, Bluetooth 2.1, GPS. 32 GB internal storage, no flash card slot. Browser with HTML5 and Flash 11.2 support. Stereo speakers and microphones, six-axis gyroscope. Supported video formats: H.264, MPEG-2, MPEG-4, VP, WMV 9. Supported audio formats: AAC, ARM, MP3, WAV, Sorenson, WMA. 7.6" (w) x 5.1" (h) x 0.4" (10 mm) (d), 425 grammes. 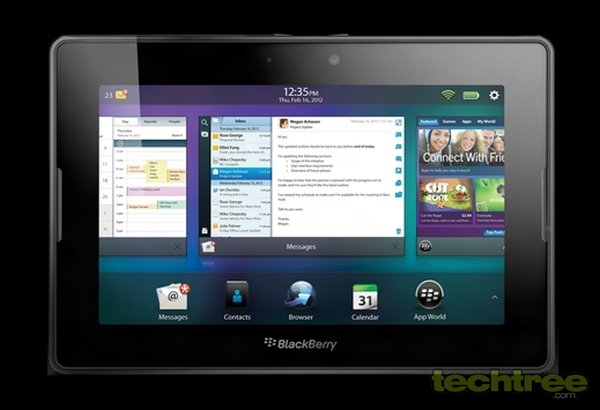 The 4G LTE PlayBook will first be made available in Canada on 9th August, hitting the rest of the world at a later date. However, as of this writing, we neither have an exact launch date for India, nor details of the price.